SEO, you either love it, hate it or somewhere in between. If you do decide to implement search engine optimization as part of your inbound marketing campaign, you should know that some of the factors required, among other things, are keyword research, site usability and structure, and the one that is often overlooked at, monitoring your progress. There is no point of implementing the best SEO practices, making use of SEO plugins, writing awesome content that provides value to your visitors, and not see how your efforts are doing. Something to think about: SEO is a competition. You have to be more popular and more relevant than your competitors to succeed (exclude friends, family members and your community). Keep it clean, and remember to take action. Taking action in itself is already a competitive advantage, over those who don’t. Anyway, if you are providing SEO services, thinking of, or simply a DIY SEO practitioner, then this is where all the things may start to get a bit tedious. Conducting proper keyword research, analyzing competition, track backlinks, checking for broken links, checking your ranks progress and more, are simply not an easy task to do without the help of some tools, whose purpose is just that, to save you time and make your tasks a bit easier. With that said, the SEO tools I mention here are by all means not the only ones that are available. There are literally tons of them and some work well, while others don’t. Difficult to keep track on all of them so, I am limiting this list to those that I have used and believe that are sufficient to get you started. Post is rather long..
Google SEO Tools: You may not be aware of it, but Google has probably the widest array of tools under your disposal. Take the AdWords Keyword Tool for example. What is there to say about this tool? This is probably one of the most “talked about” keyword tool on the internet. There are tons of tutorials and tips out there on how to use it properly. Google’s keyword tool is great, but one drawback is that you can not use it to analyze competition. There is probably some misconception about the “competition” column that you see in their results, which you should know, is about the “advertisers” competition for that particular keyword, rather than competing websites. This data is good to pinpoint saturated niches for example. 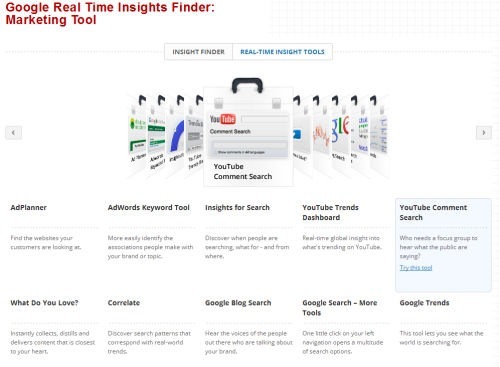 So aside from Google’s keyword tool, you also have YouTube keyword tool, Google Insights (great for product search), Google Webmaster Tools (Quick Start Center), Google Analytics, Google Page Speed Online, and perhaps one that you are not aware of, Google’s Real Time Insights Finder – Marketing Tool (take it for a test drive). 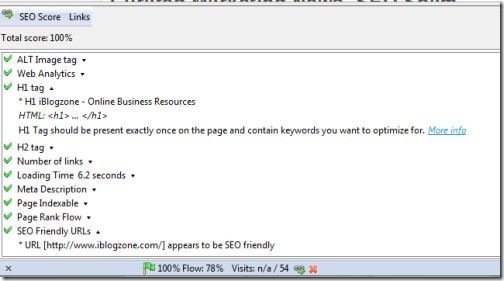 Tynt SEO: Found out about this tool from Ana’s post on MySEOCommunity.com. The post essentially teaches you how to take advantage and defend yourself from “people who copy” your content. There is really not much of a problem when someone copies an excerpt of your content and attributes a link to the original source. The problem is when they don’t give you the proper attribution. Tynt SEO essentially inserts a piece of code on every single page (not just content) of your site, and every time your text or images gets copied, Tynt adds automatically an attribution link, back to where your content was copied from. It is really an awesome tool and after using it only for 7 days, I can see already that it appears to paying off. Remember that not all links carry the same weight, but it this case, whether or not the link is of authority, it still links back to you, something that Matt Cutts says, it is better than “nothing”. What I like best about Tynt? Not only it does what it says it does, you also get some real cool SEO reports (e.g., how many copied your content and linked back to you – forced via Tynt), and best of all, It is free . Want to see how it works? Try copying any text (like a paragraph) from here and paste it on Word. SEMRush: From the developers of the popular SEO Quake, SEMRush is an advance keywords/competition research software that essentially let’s you see how your site (or any other), is doing in Google search engine rankings (or Bing), in addition to many other related advanced search engine marketing techniques. With its huge database of keywords, you will find some of the most popular (including hidden keywords), most searched for terms, and also highly competitive and expensive keywords. 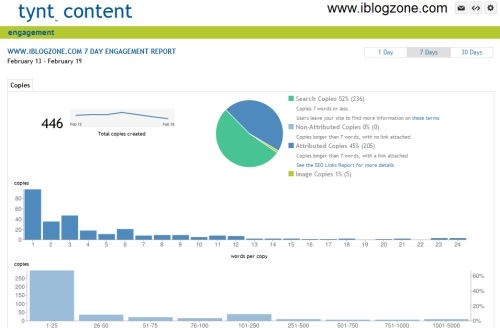 The free version is fully workable and is only limited to 10 queries/day and 10 results per query. Give it a try as you may not need anything else than what is provided on the free version. BTW, free is free and not a trial. 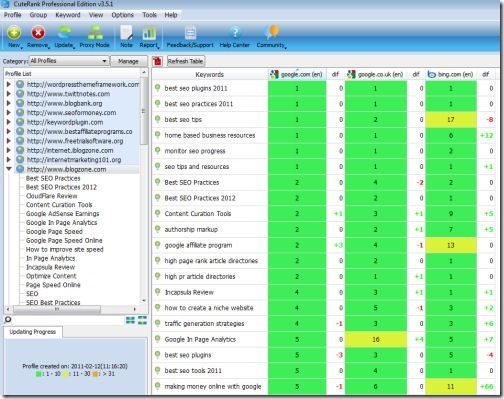 GTMetrics: Quickly becoming one of my favorite tools to analyze and test page speed online. With GTMetrix, you can check Google Page Speed and Yahoo YSlow score of any web site. This information is very useful, especially since page loading time is one of many factors used by Google to determine rankings. When checking your site or any other site on GTMetrics, you are given a grade (ideal would be A). If your website page loading time is more than four seconds, or have a low Page Speed/YSlow grade (C or lower), it may mean that your site requires some tweaking. GTmetrix will provide detailed explanations of what is wrong with your site and what you can do to improve it. This information is very helpful to correct all the flaws in your current WordPress theme. Here’s how my site is performing yesterday (4,92s – but needs some more work; I guess). 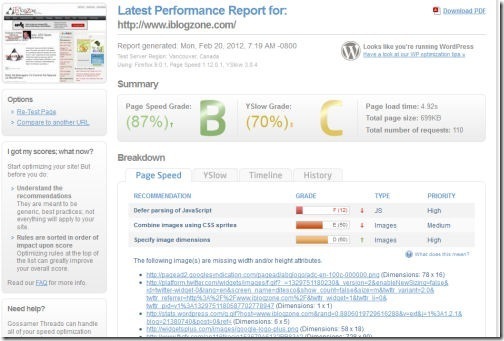 Other cool page speed checkers, include – PingDom and WebPageTest. 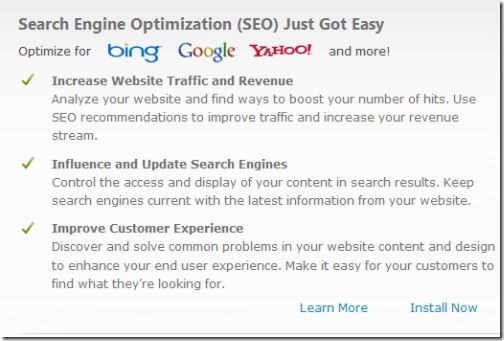 SEO Doctor: A FireFox Addon, it is a great “flyby” and simple tool, made with both beginners and experienced SEOs in mind. It’s scoring system and recommendations are based on official SEO documents, namely Google Webmaster guidelines, Google Image guidelines and Google SEO starter guide as well as Vladimir Prelovac’s (developer) own experience. Look at that! My site score a perfect 100%, woot. Run it and see what score you got. CuteRank: Remember, SEO requires a lot of work and one of them is to monitor your progress. This free keyword rank checker (software) is a desktop app, designed to automatically check your keyword positions and track their performance (keeps history) on multiple search engines. Instead of trying to figure out what position your are in, just insert multiple keywords you are checking for, or let CuteRank automatically detect keywords for you, and let it do its magic. One thing I really like about this app is that it returns results in near “real time”. This really is a time saver and the free version has absolutely no catch. It is free for life and safe to use. The only limitations of the free version is that you can only check your rankings for one domain at a time, and you can not create reports with your own brand (not good if you are tracking for clients). Such limitations are easily lifted with the premium version (if you are interested). Totally recommended and for now, the only one I really use. It is quite accurate . As I mentioned earlier, Google AdWords Keyword tool, is a great resource for “finding keywords”. Once you find those keywords, the next thing would be to analyze competing websites that are also targeting for those same keywords. While there are many ways you can achieve this, I will provide you with two options for now. First is to use Prelovac’s clever way of doing keyword research (really good). The other option is to use LongTailPro. LongTailPro is a paid software that does all the hard work for you. It helps you find keywords and available domains (good for creating niche sites), analyze competition and also includes a rank checker to monitor your progress. I have been using LongTailPro (as an alternative to MS) to create niche websites, and I am pretty satisfied with the results. For now, I just wanted you to know about this tool and stay tuned for an in-depth review soon. In case you can’t wait, head over there to find out more (watch the demo video).